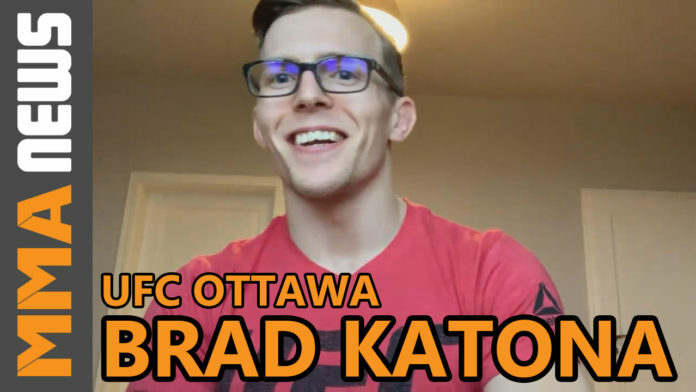 Brad Katona had some well-deserved time off. The Ultimate Fighter 27 featherweight tournament winner took a much-needed break after a busy 2018, which saw him compete four times in the calendar year. On May 4th he’ll step back into the octagon opposite Merab Dvalishvili at UFC on ESPN+ 8 in Ottawa. For the SBG Ireland product, the timing for this matchup couldn’t be better. Katona (8-0) is coming off a unanimous decision victory over Matthew Lopez at UFC 231 in Toronto this past December. The 27-year-old defeated Kyler Phillips, Bryce Mitchell and Jay Cucciniello to take home The Ultimate Fighter 27 tournament crown. Now competing in his second straight fight in his natural weight class of bantamweight, the Winnipeg native won’t have one key member of his team with him on fight night. Dvalishvili (8-4) is coming off his first UFC victory after defeating Terrion Ware by decision at UFC Fight Night 136. The Serra-Longo fighter snapped a two-fight losing streak with the victory and looks to break the undefeated streak of Katona. While the 28-year-old will likely be a betting underdog heading into the fight, Katona isn’t taking him lightly. UFC on ESPN+ 8 takes place May 4 at Canadian Tire Centre in Ottawa, Ontario, Canada. The main event pits Donald “Cowboy” Cerrone against Al Iaquitna in a lightweight bout.